The biggest threats to wildlife in Laurel Canyon are development and fences. If you need a fence to contain pets or children, consider fencing only a small area of your property, and leaving the rest for natural habitat, which is in such short supply. If you're planning to develop property, consider the virtue of a light hand on the environment. Vegetation in the Laurel Canyon area reflects the conditions of the moist coastal-facing mountains and the drier valley-facing slopes. All of the plants and trees are affected by the Pacific Ocean on the one hand and the dry deserts on the other. The resulting cool, wet winters and hot, dry summers create a Mediterranean-type ecosystem. By far, the dominant vegetation sub-type is chaparral. 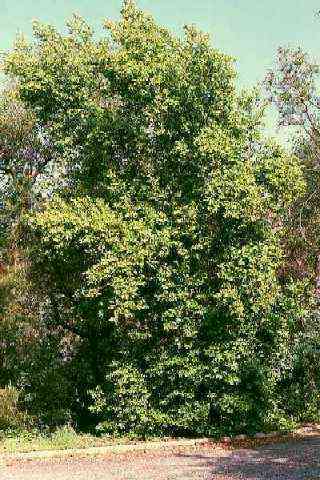 Chaparral is composed of drought and fire tolerant evergreen shrubs that range in height from four to ten feet. Unless recently subjected to fire, or some other type of disturbance, this plant community is generally too dense to penetrate. Another unique shrub community to Southern California is sage scrub, which varies between coastal and inland types. Sage scrub vegetation contains fewer stout, woody shrubs, and more openings with fine, delicate plants. The upper slopes in Laurel Canyon were almost entirely covered in chaparral or sage prior to human development. On the canyon floors, the most common riparian (stream-related) woodland species are various willows, coast live oak, California sycamore, and Fremont’s cottonwood. Less common species that are relics of the last ice age include white alder, big-leaf maple and black cottonwood. The oak family, which includes the coast live oak (Quercus Agrifolia) and the California bay laurel and from which we get the word "cork", are the most common large tree species in the Santa Monica Mountains. The coast live oak is especially critical to the ecosystem because of its resistance to fire and prodigeous production of acorns, which have been important food sources for people and wildlife. "Encina has been highly valued by Chumash, who have used its wood for fuel, bowmaking, games, cooking utensils, and cradles. They also used its bark for a red dye for hides. They used its bark and galls in medicine (tannins have astringent properties). Its bellotas (acorns) have been used as food for at least 5,000 years. The acorns are dried, finely ground, and leached of tannins, then cooked into an unseasoned mush." Oaks, which are somewhat protected by three separate city laws, are under attack from developers and the replacement of vegetation with non-native species. The worst is the blue gum eucalyptus. "Of the many eucalyptus species that evolved with fire, none is more incendiary than blue gum. "Gasoline trees," firefighters call them. Fire doesn't kill blue gums. Rather, they depend on fire to open their seedpods and clear out the competition. And they promote fire with their prolific combustible oil, copious litter, and long shreds of hanging bark designed to carry flames to the crowns. Blue gum eucalyptus doesn't just burn, it explodes, sending firebrands and seeds shooting hundreds of feet in all directions. Living next to one of these trees is like living next to a fireworks factory staffed by chain-smokers." Eucs flower in winter, attracting insects and insectivorous birds. To deal with the sticky gum, Australian honeyeaters and leaf gleaners have evolved long bills. North American leaf gleaners such as kinglets, vireos, and wood warblers have not; so the gum clogs their faces, bills, and nares, eventually suffocating them or causing them to starve." Another problem is their instability. Ecualyptus have shallow root systems and will easily topple over in strong winds, crushing houses, cars, utility lines and people. The DWP has declared them a public nuisance. So, if you've got a eucalyptus growing on your land, get rid of it. Despite development, Laurel Canyon is rich in wildlife. This richness is supported by a tenuous network of cross-freeway habitat linkages and wildlife corridors that keep the various ranges biologically inter-connected. Population analyses show that without these movement corridors, the Santa Monica Mountains contain insufficient habitat to support larger mammals. There are over eighteen species of snakes and eight species of lizards in our area. The most common snakes are pacific rattlesnake, gopher snake, California king snake, and California striped racer. The rattlesnake is the only venomous snake in California, and they are found in the brush and along tails in Laurel Canyon. They seek shade during the hottest summer afternoons and hibernate during winter. Laurel Canyon also supports various species of frogs, newts and salamanders. As with most parts of the world, frog populations have declined probably due to climate change and pollution. When streams ran freely in Laurel Canyon, they probably supported populations of native fish. Edited from information supplied by the Santa Monica Mountains Conservancy, www.smmc.ca.gov. As we are located on the Pacific Flyway, there are hundreds of birds that make an annual pilgramage through our canyon. Here's a non-exhaustive list complied by neighbor, Maria Gritsch. The "M" stands for migrator; most of the migrators arrive during April and are around through late July. After more than four years observing the movement of carnivores in the Santa Monica Mountains surrounding Los Angeles, National Parks research scientist Ray Sauvajot feels confident in predicting the future of coyotes, bobcats, foxes and mountain lions in the area. Whereas most local residents never see these animals, Sauvajot has direct and regular contact with them. If the past is any indication of the future, Sauvajot does not foresee a happy future for most of these species. 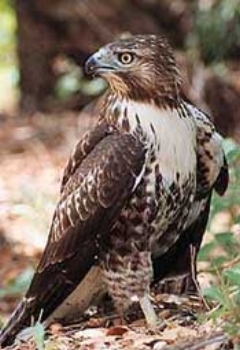 The Santa Monica Mountains provide a haven for 450 animal species, including such rare species as the golden eagle, mountain lion and bobcat. Yet given the pace of development in the Los Angeles region, it is unlikely that these animals will be able to survive in increasingly small pockets of wilderness. Indeed, scientists estimate that 1400 acres annually fall prey to development in the Santa Monica Mountains alone. Given that a mountain lion needs many square miles of uninterrupted wilderness to survive, it is clear that it will soon be impossible for the animal to remain in the region unless drastic steps are taken to halt the consumption of open space. Don't erect fences that limit wildlife movement. Don't install bird feeders as they delay migration and create dependencies. Don't trim taller trees during the spring nesting season. Don't use poison to kill rats and goffers. Predators and scavengers may eat the dead animal and injest the poison. Keep cats and small dogs indoors as coyotes will attack them. Be careful driving at night as mule deer and coyotes are active at night and will roam on the streets. Plant only native shrubs and trees. They use less water and will help maintain the eco-system of the canyon. Do not plant or tolerate eucalyptus trees on your land. Use vegetation and terracing to hold steep hillsides together. Avoid clearling brush to the dirt or spraying hillsides with cement. Remember: Every resident is a custodian of the greenbelt called the Santa Monica Mountains. It is your responsibility to preserve natural habitat.